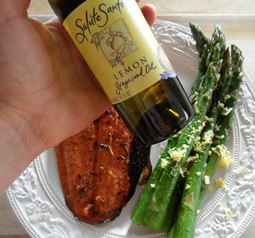 Balsamic & Honey Glazed Salmon with Lemony Asparagus - A recipe from Savor California, the online showcase for extraordinary gourmet foods and beverages from California. In a small mixing bowl or blender, combine all of the ingredients for the balsamic marinade except for the lemon juice. Whisk or blend until oil and vinegar are well incorporated and no longer separate. Place salmon fillet in a baking dish (a small casserole dish). Pour the marinade over the salmon and allow it to marinate for at least 15 minutes (or up to 24 hours covered in the refrigerator). Turn the oven on high broil. Just before putting the salmon in the oven, drizzle the lemon juice over the fish. Bake for 10 to 12 minutes on the top rack or until salmon is glazed, browned and sizzling. While the salmon is baking, prepare the asparagus. Wash the asparagus and cut off the bottom inch and a half of each stalk and discard. Spread the asparagus on in a large skillet. Drizzle the lemon grapeseed oil over the asparagus and spread the oil on the asparagus with your hands so that all stalks are completely coated. Sprinkle asparagus with desired amount of salt and pepper. Sauté over medium heat for 5 minutes. Add the two tablespoons of vegetable stock and cover the skillet. Sauté 4 minutes. Remove lid and add the minced garlic. Place cover back over the asparagus. Continue cooking an additional 3 to 5 minutes until asparagus is cooked but not too soft. Grate lemon zest over the top of the asparagus.